Visa support to Uzbekistan. Get online Visa and LOI to Uzbekistan free! Process of obtaining Visa support and Letter of Invitation to Uzbekistan can easily pass with assistance of Peopletravel. 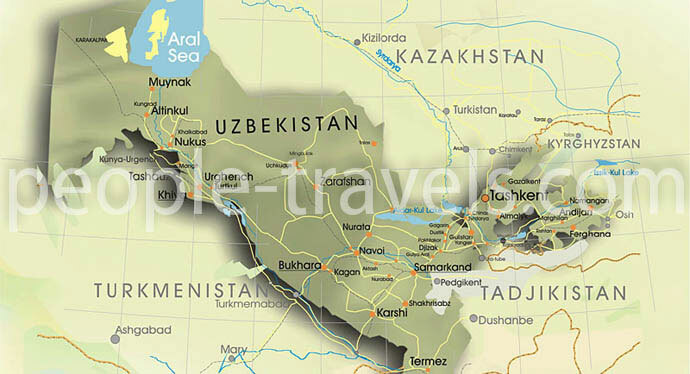 All tourists travelling to Uzbekistan must have valid Uzbekistan Visa and travel document. An exception is made for citizens of CIS member countries who can travel to Uzbekistan with no Visa support or LOI. These countries are: Armenia, Azerbaijan, Belarus, Georgia, Kazakhstan, Kyrgyzstan, Moldova, the Russian Federation and the Ukraine. On February 10, 2018, in Uzbekistan a visa-free regime for citizens of 7 countries was introduced for a period of 30 days. The countries are Israel, Indonesia, the Republic of Korea, Malaysia, Singapore, Turkey and Japan. There is a list of countries, citizens of which may have a simplified obtaining of Uzbek tourist visa, visa free transit, temporary stay and departure from the Republic of Uzbekistan. The countries are Australia, Austria, Albania, Algeria, Andorra, Antigua and Barbuda, Argentina, the Bahamas, Barbados, Bahrain, Belize, Belgium, Bulgaria, Bosnia and Herzegovina, Brazil, Brunei Darussalam, Bhutan, the Vatican, Great Britain, Hungary, Venezuela, Vietnam, Gabon, Guyana, Guatemala, Germany, Honduras, Grenada, Greece, Denmark, Dominica, Dominican Republic, India, Ireland, Iceland, Spain, Italy, Canada, Qatar, Cyprus, China, Colombia, Costa Rica, Kuwait, Latvia, Lebanon, Lithuania, Liechtenstein, Luxembourg, Mauritius, Macedonia, Maldives, Malta, Morocco, Mexico, Monaco, Mongolia, Nauru, the Netherlands, New Zealand, Norway, the United Arab Emirates, Oman, Palau, Panama, Peru, Poland, Portugal, Romania, San Marino, Saudi Arabia, Seychelles, Saint Vincent and the Grenadines, Saint Kitts and Nevis, Saint Lucia, Serbia, Slovakia, Slovenia, the United States of America, Suriname, Thailand, Trinidad and Tobago, Tunisia, Turkmenistan, Uruguay, Fiji, Philippines, Finland, France, Croatia, Montenegro, Czech Republic, Chile, Switzerland, Sweden, Sri Lanka, Ecuador, Equatorial Guinea, Estonia, South Africa, Jamaica. There is a list of countries, citizens of which are enrolled the procedure for issuing an electronic tourist visa to Uzbekistan. The countries are Australia, Austria, Albania, Andorra, Belgium, Bulgaria, Bosnia and Herzegovina, the Vatican, Great Britain, Hungary, Germany, Greece, Denmark, India, Ireland, Iceland, Spain, Italy, Canada, China, Kuwait, Latvia, Lithuania, Liechtenstein, Luxembourg, Macedonia, Malta, Monaco, the Netherlands, New Zealand, Norway, the United Arab Emirates, Oman, Poland, Portugal, Romania, San Marino, Saudi Arabia, Serbia, Slovakia, Slovenia, the United States of America, Thailand, Finland, France, Croatia, Montenegro, Czech Republic, Switzerland, Sweden, Estonia. If your country is not in the list, you will need a letter of invitation to Uzbekistan (LOI), which Peopletravel provides you free of charge! The approval of visa support takes from 7 to 10 working days by the Ministry of Foreign Affairs of the Republic of Uzbekistan. The approved Letter of invitation to Uzbekistan is sent to the Embassy or Consulate of the place of issuance. If you are coming from a country where there is no Embassy or Consulate of the Republic of Uzbekistan, then you can obtain your visa at the Tashkent International Airport upon arrival. Visa fee to Uzbekistan varies from USD 60-120, and consular fee may vary depending on the country of visa obtaining and your citizenship. According to Uzbekistan legislation, Peopletravel does not supply with Letter of Invitation if no services are purchased from us. Peopletravel – is not responsible for timing visa and Letter of Invitation approval by the Embassy, Consulate or MFA of the Republic of Uzbekistan; as well as if your LOI or visa is rejected by the Embassy, Consulate or MFA of the Republic of Uzbekistan.